I’m standing in solidarity with the families whose lives, livelihoods and futures are threatened by the impacts of climate change. I’m supporting their brave decision to take European lawmakers to Court, and their demand that the EU protects our fundamental rights and urgently acts to ensure a future safe from the catastrophic impacts of climate change for all. A handful of families are making history. They’re taking the EU to Court. On Monday, 13 August 2018 the European General Court has accepted their case. This is an important first step in the proceeding of the People’s Climate Case. The European Parliament and the Council of the European Union are expected to provide their first defence in two months. But with more hives declining and bees dying in harsh summer heat than ever before, Ildebrando’s family is now struggling to save their livelihood. They’re among the first Europeans to acutely experience the impacts of the warming climate. 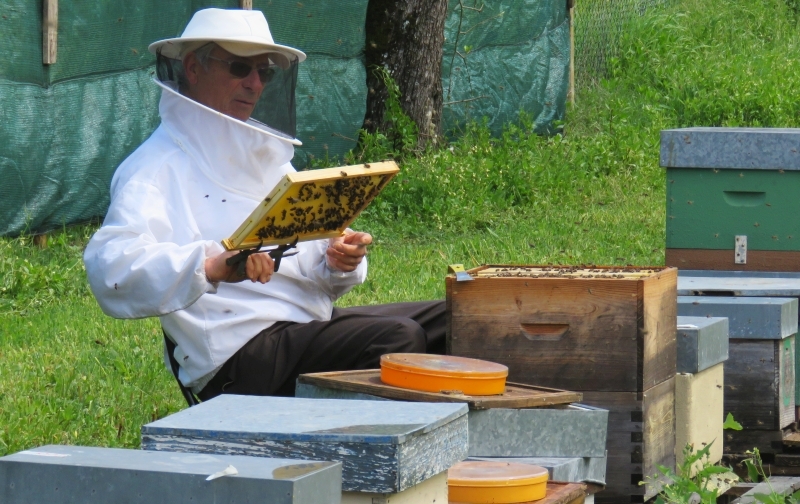 Beekeeping has been Ildebrando’s family’s business for decades. They produce honey and wax, and depend on bees for income. But changes in flowering seasons and unusually warm weather are destroying the hives. Last year, the family lost 60% of their production. Together with nine other families, they’re doing something never done before: suing the EU for failing to act against climate change and demanding protection for our rights. Climate change is not our distant future. For some of us, it’s already here. A family in Germany is afraid to lose four generations’ lives work to rising sea levels. Severe droughts have cost an elderly couple in France almost half their harvest. A family of beekeepers in Portugal is desperate to save their livelihood, but heat waves are killing their bees. They share one fear: what will happen to our children? "I wish my children had a future right here on the earth where we are standing now, on our ancestors' land. I don't want them to leave, as I did, for foreign countries to look for work," worries Petru Vlad, a shepherd from Romania. The families suing the EU come from Germany, Portugal, France, Romania, Italy, Sweden and from beyond Europe. They all risk losing their traditional livelihoods to climate change. The families know: unless we get serious about fighting climate change, the impacts we’re already suffering will be just the beginning. Science tells us that the worst can still be avoided. But the only way to ensure a safe future for our children is to prevent catastrophic impacts of climate change by adopting strong, ambitious laws. In a lawsuit to the European General Court the families accuse the the European Parliament and Council of the European Union of failing to adopt effective laws to adequately fight climate change. They want the EU institutions to recognise climate change as a real threat to human rights of people in Europe, and urgently act to protect our rights and those of the future generations. So far, European lawmakers - the European Parliament and the European Council - have failed to put in place meaningful laws to obligate countries to take effective action against climate change. The EU’s emission reduction targets are far too low to reflect the urgency of the problem. The lawsuit brought by the families underlines the stark reality: climate change is no longer just about diplomacy or economics. People’s fundamental rights to life, health and property are already under threat. They have a tough battle ahead, but their stories have the power to change reality. To stay strong in the struggle they undertake in the name of all of our futures, the families need our support. It might be easy for the EU lawmakers to ignore a handful of families, but we can make it really tough to ignore tens of thousands of us symbolically standing behind them. Our words of solidarity will show the plaintiffs and the lawmakers that they’re not alone. The campaign photo on top of the page shows Ildebrando and his beehives. Credit: ZERO. This is of high imports to every thinking person.....we have to get our act together before our world as we know it collapses. This is SERIOUS!!! All those living on this planet need to understand that it's critical to pull out all the stops. There is no time left to discuss, disparage or dispute scientific evidence. The climate apocalypse is almost upon us and all of us have to act now to stand a chance of survival. This is the most important global issue at present. The question is why would it not be ! Gratitude for what nature provides and none for what greed of GOVERNMENTS DENYING what is blatantly the destruction of our Home, this Planet. It can heal, but we have to protect it now. There are natural alternatives, like hemp, bamboo, wind, solar etc.etc etc. Climate change is already here. The families taking the EU to Court are acutely experiencing its first impacts. And it’s here to stay -- we can still avoid the worst of it, but we need to be strong and united in demanding ambitious action of our governments and corporations. Our European community, and our shared fight for a healthy climate, is also hear to stay. We’ve spoken up against climate injustice, demanded (and won!) strict pollution limits for EU’s biggest power plants, and pushed an insurance giant to drop their support for coal. To keep campaigning for climate justice we need your voice -- but we also need funding entirely independent from governments and companies. This means we need you and other members of our community to chip in to keep our campaigns going. Even the smallest monthly donation brings us closer to our goal, and gives us the flexibility and stable income we need to make a difference. Will you become one of the regular monthly funders of our community and help us keep up the good fight? #PeoplesClimateCase is a tough battle of families vs the European Union for protection of people's fundamental rights. Help them stay strong, sign our letter in support of the plaintiffs! Good news - Families suing for climate action have had their case accepted! This is our chance for realistic action on climate change. Add your voice to the ten families taking the EU to court on behalf of all of us. I signed the letter of solidarity and ask you to join. This historic case kicks-off today and they have a tough battle ahead. That’s why they asked for our help to make their stories and messages heard all across Europe. In a lawsuit to the European General Court they accuse the the European Parliament and Council of failing to adopt effective laws to fight climate change. They want the EU institutions to recognise climate change as a real threat to human rights of people in Europe, and urgently act to protect our rights and those of the future generations. So let’s stand on the side of the grandparents, parents and children already suffering the impacts of unchecked global warming in their struggle to get European lawmakers to act to protect our future. Add your name to our message now!